Dominic Sandbrook has a new book out soon called Seasons in the Sun: The Battle For Britain, 1974-79. It’s his fourth on Britain between 1956 and 1979, and the Daily Mail has excerpted a section on the Winter of Discontent, the months of strikes by local authority workers in response to Prime Minister James Callaghan’s cap on wage increases in late 1978. Sandbrook notes on Twitter that the excerpt has been “heavily abridged and slightly Mailified,” but presumably it doesn’t distort his argument too much. I like Sandbrook’s work; he’s usually even-handed and his broad approach to political and cultural history is just my kind of thing. State of Emergency, the last volume in his series, is excellent, and his book on American right-wing populism in the post-Watergate years is a decent starting point for understanding the cultural influences on the conservative movement in the 1970s. One criticism I do have of Sandbrook is that the voices of ordinary Britons and Americans rarely make it into his analysis. His narratives of the 1960s and ’70s are mainly told through the actions of political players and cultural figures, or with polling and analyses which tend towards painting the public with broad strokes. You can only tell so much about the average working Briton from the headlines of The Sun, or indeed, the Daily Mail. The trades unions scuppered this strategy [to control inflation] — not the leaders, as is commonly assumed, but the rank and file. They were not politically motivated. Most young workers dreamed of new cars, colour televisions and foreign holidays, not the inevitable triumph of socialism. They were tired of being told to wait for jam tomorrow; they wanted it today, tomorrow and the day after. If you’re going to make the case that the strikes were about “the pursuit of material security,” as Sandbrook does here, then you need to offer some evidence to back that up. But the strikers are almost entirely absent from this narrative, except as a singular mass of pickets besieging the city of Hull, or battling police outside Berkshire factories. Where does Sandbrook get the impression that striking bin-men just wanted a Thomas Cook package holiday to the Canary Islands? Is it wrong to assume that Sandbrook and/or the Daily Mail have an agenda in portraying the typical union member of the late 1970s as being motivated by personal gain rather than any carefully thought-through political belief? I had thought Sandbrook was more sympathetic and understanding to the working class than this. This narrative deliberately excludes the voices of individuals within the larger group of striking workers that might explain why a local authority employee would choose to strike in late 1978. By creating such a “frenzy of greed” explanation, working class political and economic power, through the vehicle of organized labour, is therefore discredited and ultimately de-legitimized. There is no space for working class solidarity, as each striking worker is purely looking out for his own material interests. This has almost become the accepted narrative of the labour struggles of the late 1970s, and the obvious point behind it is to imply that workers held too much power and were fundamentally unequipped to handle it. Sandbrook’s argument, similar to many others from both the political right and the centre-ground, suggests that the working class misunderstood economics, failing to account for the inflationary effects of wage increases, and therefore proved their inability to handle the political power they had gained through the labour movement. The implications of this narrative are, firstly, that working class power and representation in the political system needs to be urgently restrained, with limits placed on the right to strike and on the ability to organize in the first place, and secondly, that the rightful political power of the elite be restored for the sake of the smooth running of the country. The Conservative Party under Margaret Thatcher, of course, pitched itself to Britain on exactly those two principles in the year following the Winter of Discontent. On the other side of the Atlantic, the same political and economic struggle was playing out at roughly the same time. 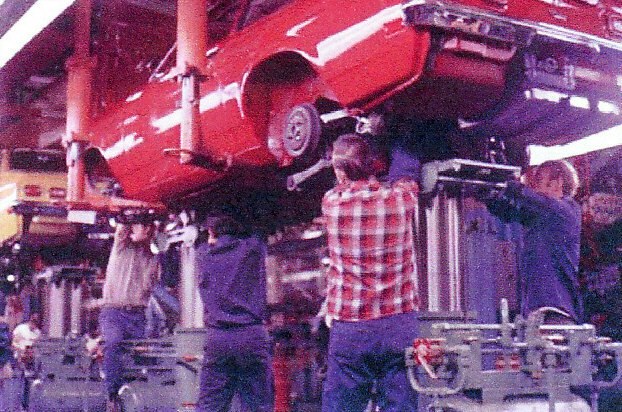 The idea behind the “Lordstown Syndrome” that this blog is named for was essentially that American workers had gained too much power to disrupt the economy, and that any further coddling of the rank and file would likely lead to similar scenes as those occurring in Britain’s cities in 1978-’79. “Syndrome,” of course, implies a sickness or disease at the heart of American labour. I’ll explore how the “frenzy of greed” narrative was applied to America’s unionised coal miners in a second part of this post tomorrow, but this seems a good place for a break. Over at the New York Times‘ Economix blog, Steven Greenhouse, the Times‘ labour correspondent, notes a recent Gallup poll asking Americans for their opinion of labour unions. The results of the poll show that 52% of Americans approve of unions, while 42% disapprove. Gallup has been polling Americans on this question since 1936, the year after the Wagner Act was passed, at regular intervals, and the historical results show public approval for unions remained high (near or above 60%) throughout the twentieth century and right up until 2009, when approval suddenly dropped eleven points to a record low of 48%. Disapproval reached an all-time high that year of 45%. In 2010, approval for unions rebounded slightly to 52%, with disapproval at 41%, so this year’s results suggest some flattening out of public opinion, and perhaps the beginning of a new era in how Americans understand and relate to organised labour. Back in 2009, when Gallup’s poll recorded the nadir of public approval for labour unions, Nate Silver pointed out that public support for organised labour was closely related to the unemployment rate. Silver used Gallup’s polling on this question going back to 1948 to conclude that “for every point’s worth of increase in the unemployment rate, approval of labor unions goes down by 2.6 points.” Silver didn’t speculate as to why the two factors seemed to be related, but it doesn’t really need pointing out that when Gallup asked this question in August 2009, the U.S. was in the midst of the harshest period of the Great Recession, with unemployment above 9% and rising. Now, unemployment in 2011 is still up around 9%, whereas public opionion of labour unions has risen by 4 points since 2009, so Silver’s trend line can’t fully explain the phenomenon. Nevertheless, there’s a substantial link between the American public’s concerns over unemployment and the state of the economy as a whole, and their view of labour unions. It might be fair to say that more Americans sympathise with the belief that unions hinder the American economy and prevent employers from creating jobs in a tough climate when economic growth is stagnant. That’s not to say that this is true of unions, but it is a major image problem the labour movement faces in convincing the public of its relevancy in the twenty first century. Steven Greenhouse notes the explanations both Labour movement officials and business leaders give for this year’s polling results, suggesting the former blame the recent decline in union approval on conservative groups’ messaging of union responsibility for such issues as the bankruptcy of General Motors, while business groups claim that workers “no longer see a need for unions.” Clearly many Americans do still see a need for unions, and the discrepancy between the 52% who approve of labour unions and the 11% of American workers who belong to a union suggests that there’s something other than workers’ hostility to organised labour preventing unions from reaching much of the workforce. The gap between Americans who approve of unions and those who disapprove is undeniably shrinking, though, and as both Greenhouse and Gallup’s Jeffrey M. Jones point out, that might have a lot to do with the increasingly partisan debate over the role of labour unions in American society. The recent skirmishes in Wisconsin and Ohio, where Republican Governors led conservative state legislatures in attacking public sector unions, have intensified a much longer trend of Republican antagonism toward the labour movement. If you look at Gallup’s polling data, the first time public support for unions dipped below 60% was in January 1978, right in the middle of the long, bitter coal miners’ strike that had huge effects on energy markets in the eastern U.S. Often, the 1981 PATCO air traffic controllers’ strike is referred to as the key moment in changing the attitudes of both the Federal government and the general public toward labour unions in the U.S., but I’d say that the 1977-78 coal strike was arguably more important in setting that change in motion. It’s not the beginning of the story by any means, you could go back to several Supreme Court decisions in the 1970s forcing significant changes that would affect that relationship, or as far back as the Taft-Hartley Act of 1947, and the subsequent failure of several Democratic-controlled Congress’ to repeal that law. But the 1978 coal strike was perhaps the beginning of the public belief that unions were overly pampered and too willing to hold the rest of the economy to ransom for the sake of their high wages and great benefits, an attitude which has now been transferred onto public sector unions in states like Wisconsin, Ohio, and New Jersey. I’d suggest that both Greenhouse and Gallup are right in arguing that the politicisation of labour issues is key in shaping this tightening of public opinion on unions. For all intents and purposes, to many of the respondents to Gallup’s 2011 poll, labour unions have been definitively tied to electoral politics as an arm of the Democratic Party. As a result, I would expect that public approval of unions will remain as polarised as public support for each of the main political parties for the forseeable future, even if unemployment drops and the U.S. emerges from the current recession. The full historical results of Gallup’s polling on labour unions can be found here (pdf). What’s left unsaid in the film are the two men’s thoughts on the United Mine Workers’ relationship to safety. Luther Chaffin wears a UMWA baseball cap and a shirt with a UMWA badge embroidered on it in many of the film’s scenes, and the cancer treatment he gets in the film is largely provided by union health insurance. Luther Chaffin is actually quoted in the United Mine Workers Journal July-August 2006 issue, talking about the importance of the 1989-90 Pittston stike in securing his own health and retirement benefits. He’s clearly proud of his union membership and the effect it’s had on his life. As far as I can tell, the mine Lucas Chaffin works at is not represented by the UMW, which might suggest that Luther’s concerns are linked to his son’s lack of access to UMW safety practices and rules. The film doesn’t really make a link between the Sago disaster and the fact that the mine wasn’t organised, though. This was quite a divisive topic in 2006, and again after the Upper Big Branch disaster in 2010; some of the Sago miners objected at the time to the way the UMW and the media portrayed them as exploited workers who did not have a say on their working conditions. I think it says something about what the film-makers wanted to show of coal mining in the 2000s that they chose not to touch on this debate. The documentary is political in that it focuses on Lucas Chaffin’s experience of the work he does, rather than being political in finding a scapegoat for unsafe working conditions. I think it’s quite admirable that it doesn’t weigh in with an opinion, although I understand why someone might not feel the same way. The film deals carefully with its depiction of Lucas, who is of course a working coal miner who would not say anything on camera which might threaten his job, and I think the absence of any explicit discussion of the union reveals something about non-union coal miners’ relationship with the UMWA in the mid-2000s. Here’s the trailer for the film. It’s a very moving, detailed look at being a coal miner today.